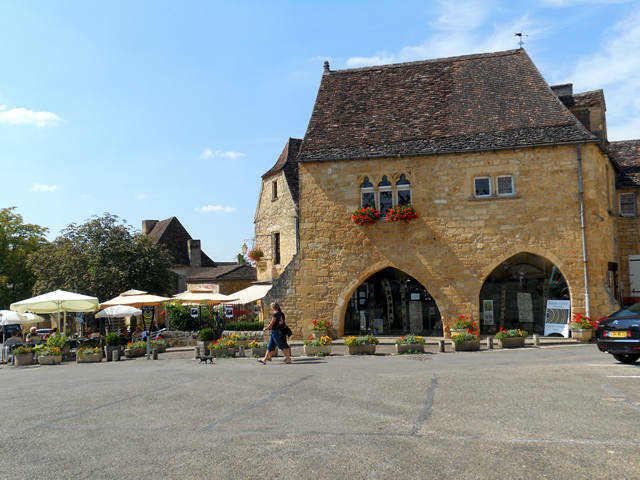 Honey stoned Domme is a typical ‘bastide’ town, well almost, it is a town that has been transplanted onto a bluff-top eyrie. Philippe III the Bold built it in 1281, however he had to use threats to get the local people to live in the town, it is very high up. Today you drive up the long winding road to the top. This is one of our favourite places for outstanding views, an excellent market on a Thursday, and lots and lots of tourist shops and cafes. 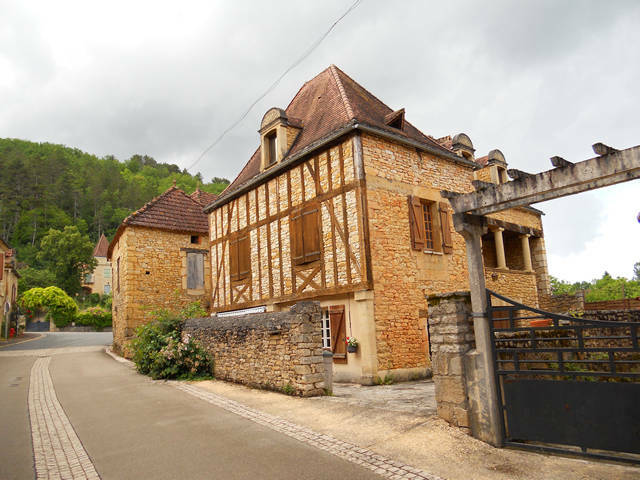 There is an excellent shop selling local wines including La Vieille Noix (liqueur) this is gorgeous and you can sample a small drink in the shop. 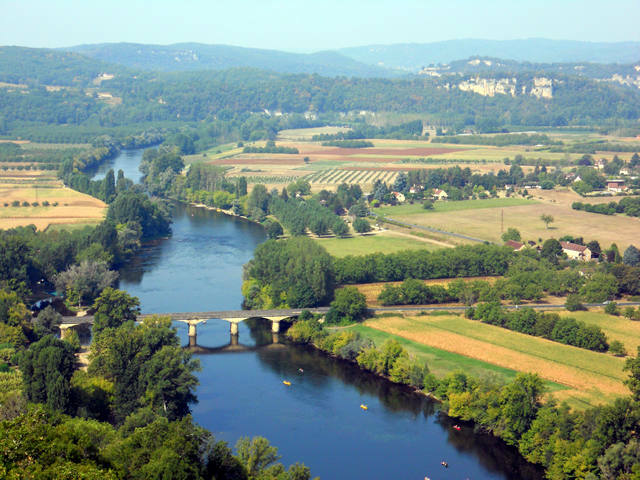 Once you climb up the hill past all of the shops you reach L’Esplanade offering a terrific panoramic view of the Dordogne valley. 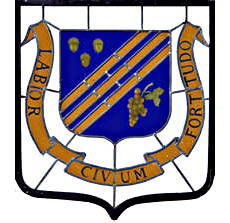 The town walls have three of the original gates. To the west there is the best preserved gate, the 13th –century Porte des Tours, its narrow entrance is flaked by two large guard towers built by Philip the Fair. 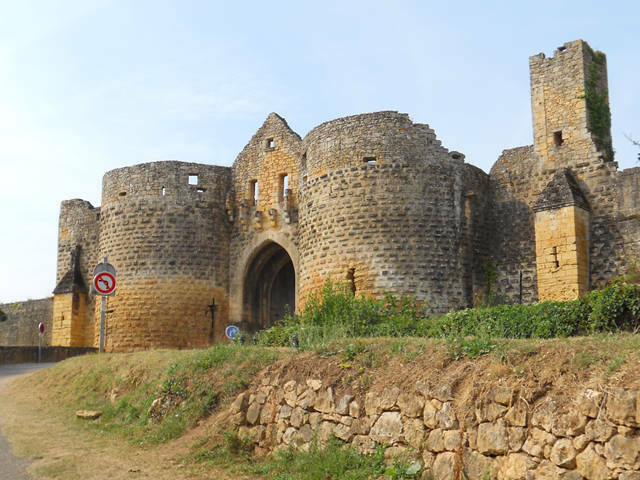 These were converted into prisons in 1307 when the King ordered the arrest of the knights Templar; a few of the Templar lingered in the prison until1318, engraving the crucifixes and other graffiti onto the stone walls. This is our last ‘blog’ for a while, we are going to France, so we shall ‘blog’ again on our return. Thanks again for reading and looking at our favourite places, and for the excellent comments. 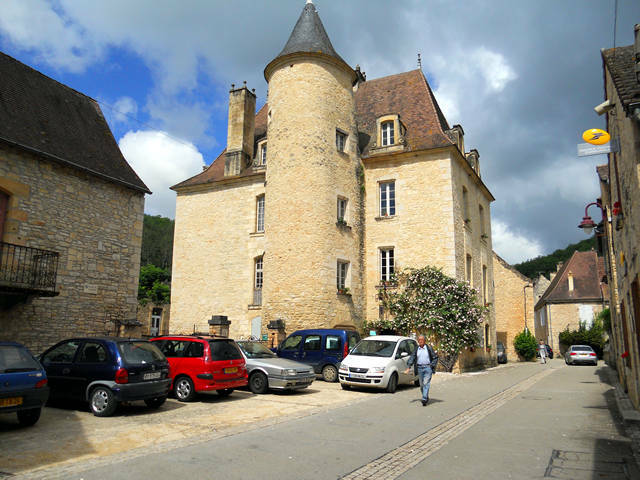 It is getting very close to our second visit of the year to Daglan and our minds are now thinking of what to take to France and which room we shall be renovating during our stay. We thought that it would be a good idea to post a few more pictures of our favourite place – Daglan, to help us to reminisce a little and for you to have a look at our very beautiful village. The Marie with its excellent blue topped tower and opposite is the post office. This is one of the very interesting homes in Daglan with the stonework glowing golden in the early evening sun. 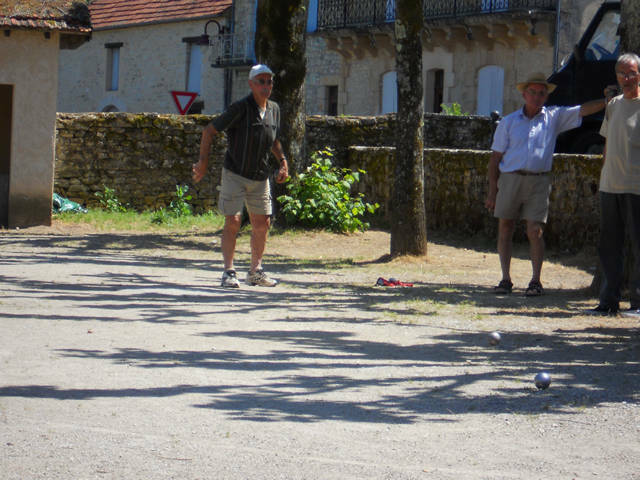 The ancient game of Pétanque played on a sunny Sunday afternoon in our village. I was asked to join in but I have never played the game before, so I said , “thank you, but no, I shall just watch and learn”. The next time I shall have a go. Pétanque is a form of boules. A player stands inside a starting circle with both feet on the ground and underarm throws metal balls to land as close as possible to a small wooden ball called a cochonnet or jack. The game is usually played on a gravel or hard dirt area, but can also be played on grass or sand. Although most of the time our village is very quiet the month of August is exceptionally busy with the circus coming to town and the Village Fete, which is always themed. 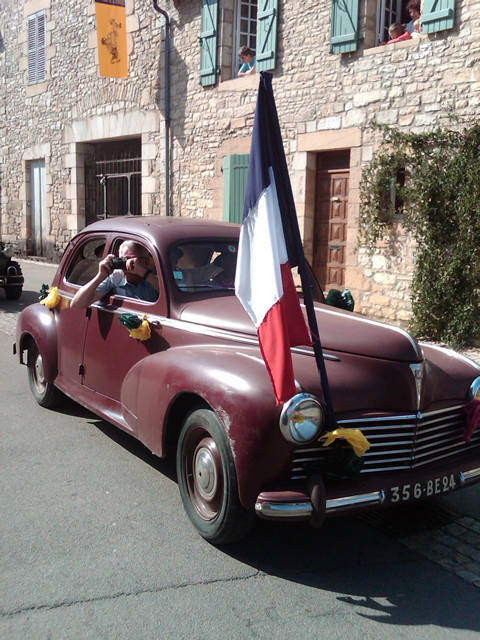 We missed last year but were lucky enough to be in Daglan for the 2011 event, the theme was the Second World War. 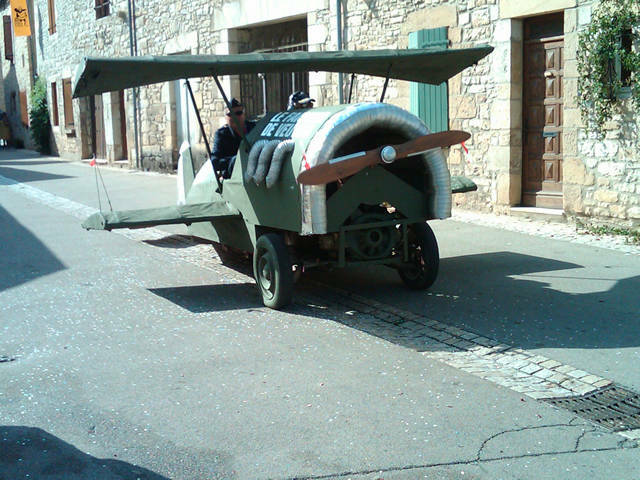 We had a long parade of tanks, anti aircraft guns, planes, vintage cars and floats through the streets of Daglan. Although in the photo below I was shot with a camera I was also hit several times with water pistols (and water cannons) fired from the floats, it was a very hot day in the high 30s Centigrade (high 90s Fahrenheit).and the cooling water was most welcome. 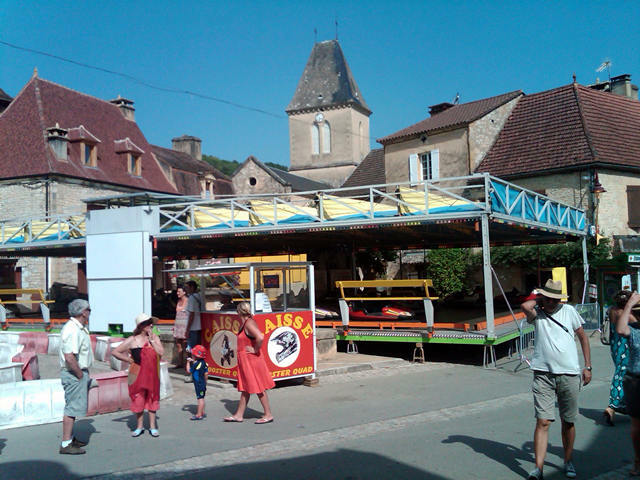 The dodgems and other fairground rides are located in the main square, just outside our home, it was very noisy, but great fun. Dogems and other fairground attractions throughout the event. So do come along for there is plenty to see. 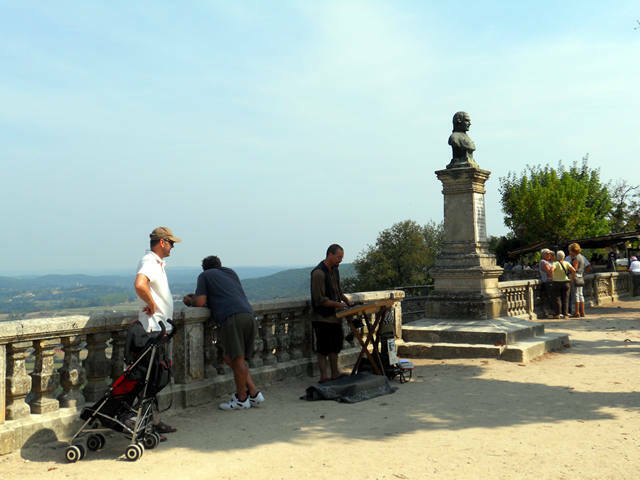 In the evening of 16th and 17th they have live bands and classical evenings, Sunday is the grand themed parade and fireworks and throughout the long weekend there are always lots of stalls selling food and drinks.